During the Soviet times, people would travel to the seaside to gather the fish. 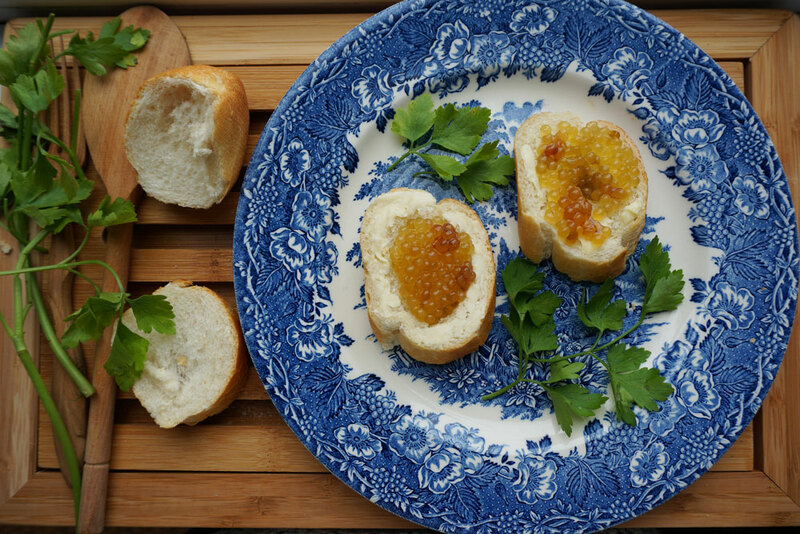 Caviar, usually associated with the rich and decadent life (especially the black variant), was an essential requirement for any special occasion during the Soviet era. One way to get it cheap was to help catch the spawning fish. When going to a Russian house and unsure of what to bring, a jar of red caviar is always a good idea. In Moscow, a jar is available for around $10, but it’s still considered a treat. Granny also said that going to the shops or getting the food “gift bag” at work wasn’t the only way to get enough red caviar to spread on your white bread. During the time of year that fish laid eggs, people would travel to the seaside to gather the fish and would either be paid in caviar for their services, or be able to buy it very cheaply. They would then come home and sell it to friends of friends. At some point, though, travelling around the country became too expensive and caviar hunting that way ceased to be lucrative. While I was getting ready to make the very complicated meal of putting butter and caviar on slices of bread, I discovered that my friend had recently acquired some from the seaside in Georgia. I invited myself over for some caviar and was surprised by its colour – it looked more yellow than red, though it was definitely salmon caviar. My friend had boiled it in salty water and put it in a jar, as instructed by the seller. Caviar can be bought from fishmongers in a “raw” form even now, still attached to part of the fish. To process it for eating, you have to separate it from the skein and boil it with salt for a couple of minutes. I’ve never actually done this myself, and the Book doesn’t give any instructions about how to do it, but my friend and I agreed that the caviar she prepared tasted like the caviar we had in our childhood; the homemade variety. The Book also says that caviar, which “has lots of protein, fat and vitamins,” comes in many varieties. It notes that one of the best types comes from the river Kura in the republic of Azerbaijan, a river that also flows into Georgia. The Book adds that the more yellow type is actually very good; my friend was right on the money with this one! Since there were no instructions on how to serve caviar, I got some fresh baguette, topped it with butter and spooned caviar on the top. Granny’s friend Valentina Mikhaylovna says her mother used to buy strips of caviar, take it off and prepare it herself. Since it was cheap, they ate a lot of it with boiled potatoes. In fact, they ate so much she can’t stand it to this day. Despite my usual indifference towards caviar, I find myself craving it now. Maybe it’s the taste of this Georgian variety, or the different colour of it. My mom and brother might have some caviar-consuming competition at our next family dinner!